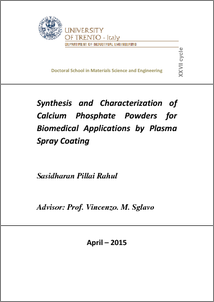 This PhD work mainly focus on the synthesis and characterization of calcium phosphate powders for plasma spray coating. The preparation of high temperature phase stabilized βTCP and HA/βTCP powders for plasma spray coating applications has been the topic of investigation. Nowadays plasma sprayed coatings are widely used for biomedical applications especially in the dental and orthopaedic implantation field. Previously Ti based alloys were widely used for the orthopaedic and dental implant applications because of its high corrosion and good biocompatibility. Due to the limited osteoconductivity edges of Ti implants with fibrous tissues delays the healing time. To overcome these limitations different types of surface modification processes are employed on the surface of Ti. The coating of HA is a widely used surface modification technique due to its excellent biological properties. HA is a well employed bone graft material due to its similarity with human hard tissues. The plasma spraying of HA on the Ti surface is the most widely used technique mainly due to its process simplicity, low cost and bulk production. The present research focuses on the modification of HA coatings for the improvement of bio-degradation properties of HA. HA/βTCP composite powders are used to overcome the poor biodegradation properties of HA. The issue related to the use of βTCP is the phase transformation (β to α) at high temperature. To overcome this phase transformation, the βTCP powder was doped with MgO. The high temperature phase stabilized MgO doped βTCP and HA/βTCP powders were synthesized by solid state method and granulated using spray granulation. The properties of the granulated powders (100-150μm) were analysed with XRD, FT-IR, SEM, flowabilty, density etc. and are used in plasma spray coating process. The produced coatings were subjected to the thermal treatment and βTCP and HA/βTCP plasma sprayed coatings are obtained. The successively produced coatings were characterized, and the invitro properties like solubility and bioactivity behaviours were studied.